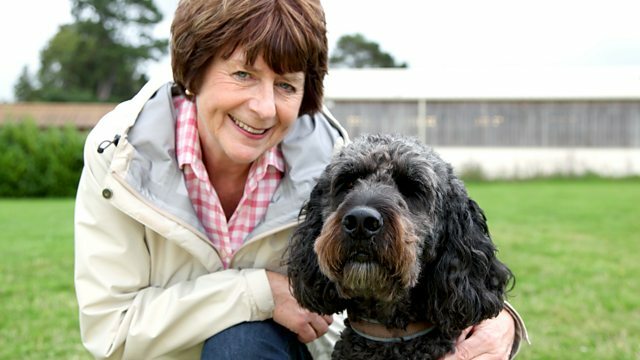 Poet and entertainer Pam Ayres makes an appeal on behalf of Canine Partners, a charity which trains dogs to help disabled people gain greater independence. Browse content similar to Canine Partners. Check below for episodes and series from the same categories and more! I like dogs, a lot. a seriously ugly stray dog on a length of string. And I loved her, I thought she was magic. like somebody, even if everybody else thinks you're a nobody. I've even written the odd poem about them. 'I always like a dog at home, it makes it nice and hairy. 'And if a burglar calls your dog will make the place sound scary. Now, I'd do anything for my dog. what your dog might be able to do for you? if they're given the right expert training. who desperately want their independence back. And I'm hoping to persuade you to do whatever you can to help. and was rushed in for emergency surgery on an ovarian cyst. leaving her completely reliant on others to perform even simple tasks. and that's all I could do. I felt like, not only had I ruined my life, I'd ruined my husbands life. Because he became my full-time carer. I lost my role, you know? My role, as a wife. deep depression as she struggled with the loss of independence. I just lost my life. and I just didn't want to be here anymore. greater independence, and a better quality of life. needs of the person they've been matched with. assisting people with disabilities all around the country. a form of cerebral palsy. until a Canine Partner came into her life, called Eli. all the time, and I can't help it. And before it was like, "Oh, please can you help me,"
and then someone would come and help me. happen again, I'd be going, "Sorry, I've done it again. "Sorry, sorry, sorry." All day long. And now, I feel guilty if I don't drop something. which makes me look at it differently. -Eli can do all sorts of useful tasks. off the floor for me, you know, I would have been happy with that. That's enough. But he does 306 different things for me. He just gives me a look. pick up the drink and give it to me. It just takes away some of the disability. I'm a lot less disabled than I was before. Can you get my hairbrush from the bathroom? All my life, I've been the one being looked after. And now I have him to look after. And that's a really nice feeling, for it not to be all about me. But I've got a responsibility, just like anybody else. And that's really lovely, I love it. rigorous training so that they really can transform lives. in many cases they do something much more fundamental. They give someone back a reason for living. It was, like, just love at first sight. I'd not felt that happiness for such a long, long time. It was an amazing feeling, it really was. Before Bliss arrived, Jenny rarely left the house. -But now, her world opened up. Before, I wouldn't have gone out on my own at all. With Bliss, we go all over the place. I will pass her the purse and she will then pass that to the cashier. Ready? Up, up, up! Take it, bring it to mummy. Good girl! I wouldn't be able to go out and do the shopping. so that means that, again, I'm not having to disturb somebody else. she'll get that she she'll pull me up so I'm sitting up. Jenny suffers from whole body spasms that attack without notice. can sense when one is coming on and warn Jenny 20 minutes in advance. and, you know, not be embarrassed in the middle of a shopping mall. a really big, big help to me. strain off her relationship with husband Daniel. It does make a big difference, having Bliss in our lives. it's lovely just to get back to how we used to be. I'm just amazed at what she can do and how talented she really is. And she's, you know, she's my little star! Really. She's amazing. In the UK, there are more than 1.2 million people who use a wheelchair. And many of those would benefit hugely from a Canine Partner. resources to place between 75 and 80 dogs a year. one of their beautiful, clever dogs. by sending a donation to Canine Partners. and the whole £10 goes to Canine Partners. Writing Canine Partners on the back of the envelope. Poet and entertainer Pam Ayres makes an appeal on behalf of Canine Partners, a charity which trains dogs to help disabled people to have much greater independence and a better quality of life. A dog-lover since childhood, Pam visits the charity's HQ to find out about the astonishing feats our four-legged friends can learn when coached by the right experts. Jenny Timms was left without the use of her legs after surgical complications. She became completely dependent on others to perform even simple tasks and fell into a deep depression. But Jenny's life turned around completely when she was paired up with a golden retriever called Bliss. Bliss can help with all sorts of practical things from emptying the washing machine to posting a letter. But more than that, she's given Jenny back a vital sense of independence.